The term ‘cult product’ gets banded about a little too often now a days. Plus, when it is dedicated to basic petroleum jelly then I have to cringe…. in my honest opinion, Vaseline will never be called a cult product. Anyway, as usual – I digress. Back to the focus of this post – YSL Touche Eclat. If you haven’t heard of it yet, then where have you been? My history with YSL goes way back to my teenage years. YSL was one of my first high-end beauty products and I re-purchased it many times. Obviously my budget was pretty limited then with just a Saturday job in a coffee shop to fund my product addiction, so I used to always have this on my birthday and Christmas list without fail for a good few years. My birthday is almost exactly six months from Christmas so this actually worked out perfectly in terms of how long a tube lasted. So, as I said I have a history of using the infamous YSL, I guess the main question that I would ask myself if I was reading this post is – if it’s so good then why did you stop using it? The answer to that is I don’t really know. My immediate thought is that is that it was too expensive – but as I was asking for it for birthday/Christmas then that cant be it. I think the reason came down to the fact that a number of other brands starting bringing out cheaper alternatives. So I started on a bit of a mission trying to find a cheaper version that did the same job – I have found some that are pretty good, but it’s only now that I was offered the chance to re-try the YSL version that I realised that I’m really trying to find the equivalent of Prada in Primark. It’s not going to happen. Although cheaper options are nice for a quick/cheap fix – they wont really match up to the original and best. And bloody annoying it is too! I always had high hopes for finding something to dismiss the quality of the YSL by finding an equivalent for half the price. 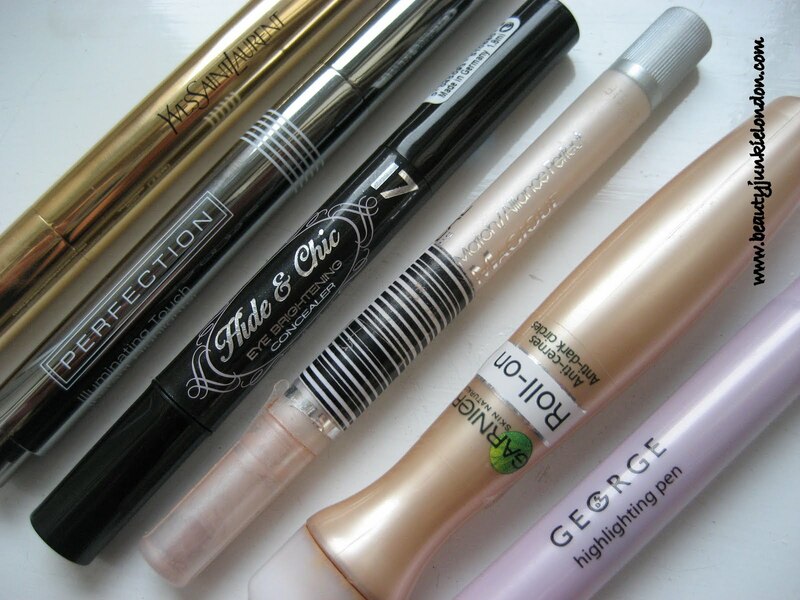 But alas, the discovery has not been made and I am again converted to having that glossy gold tube as a must have in my make-up collection. 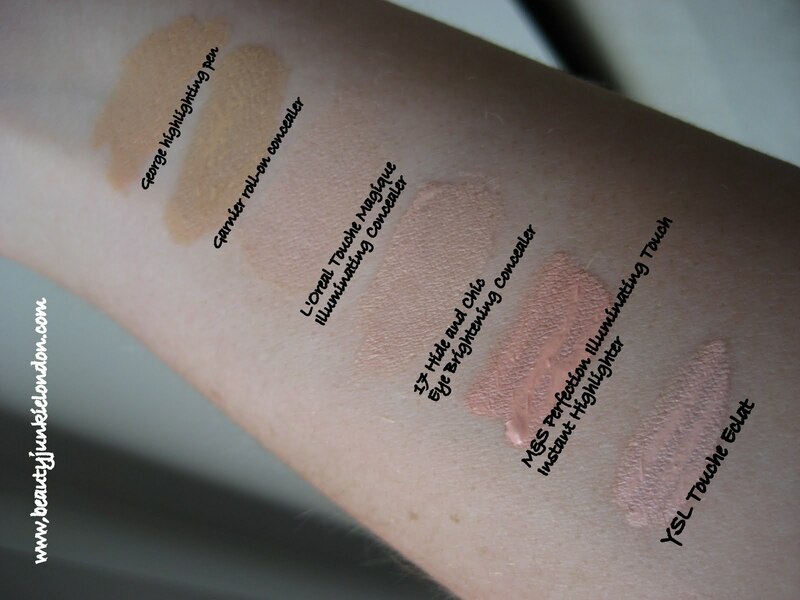 To help illustrate my point I have gathered together all the similar products I currently have in my collection and swatched and photographed them so you can see the difference. I have done a quick run-down of my thoughts on each one below. YSL Touche Eclat (£24): Personally I find the colour of this gives the most ‘awake’ look for my skin tone. Slightly pink toned so counteracts dark circles – but not *too* pink toned. The consistency is thin, so doesn’t sink into lines like thicker equivalents tend to do. This lasts really well, unlike some of the other thin consistency versions. M&S Perfection Illuminating Touch Instant Highlighter (£9.50): This is one of the recent launches from M&S. The texture of this is quite thick so I did find that it settled into fine lines – but it really does last all day. The colour is a little bit too pink for my skin tone, but the pink shade is more flattering than orange-toned concealers. The packaging is lovely and on this front gives the YSL a run for it’s money, it’s dark silver and quite heavy/expensive feeling. 17 Hide and Chic Eye Brightening Concealer (£4.49): Colour and texture wise this is decent, and if your pennies don’t stretch to the YSL you can do worse than to pick this one up. The tone is pinkish although slightly more neutral than the YSL. Another light texture so doesn’t settle into fine lines, down side of this is it doesn’t last as well and the application brush is pretty poor – the applicator seems to have about half the number of bristles it should have, so the product splodges out rather than being controlled by the applicator. Oh, and as this one wears the shimmer in the product tends to show through quite a lot. L’Oreal Touche Magique Illuminating Concealer* (I think this was about £6.99): Excuse the packaging picture. I bought this from Superdrug so it has the huge sticky security label still attached – doesn’t look pretty at all. Although even without the label the packaging is nothing special. Colour-wise this is similar to the 17 product. The texture is ever so slightly thinner and the application a bit more sheer – although this could be down to the poor quality brush on the 17 version. This would probably be my number two choice. Garnier Roll-On Concealer Anti-dark Circles (£9.99): This one is a bit different in terms of packaging/application. The roll on applicator (that seems to be the ‘trend’ of the year – last year was making everything vibrate…) does have a lovely cooling effect but doesn’t allow for specific/controlled application. The colour of this is too orange in my opinion to deliver the ‘wide awake’ look that the more pink-toned versions achieve – although this might be better suited to more tanned skin tones than mine. This is a thin consistency and doesn’t last very well at all. George Highlighting Pen (£3.50): Yep, even Supermarket giant ASDA is getting in on the under-eye concealer/highlighter act. I tried this one out about a year ago and was reasonably impressed but, like the Garnier version is again very much on the orange side, although slightly less so than the Garnier. Not bad as a general concealer but I don’t think it has any noticeable highlighting effect. So there we have it, a selection of under-eye concealers that follow where YSL lead and my personal views on them. Overall YSL would easily be my preference, but on the lower end of the budget scale I would go for the L’Oreal. I think there is a good reason than Touche Eclat is repeatedly heralded as a cult product and it really is standing the test of time. Have you tried anything that you think challenges the pedestal that YSL currently sits on? Product marked with a * above was bought by myself. All others provided for review. Honest and impartial as always. Previous Post Entry to Get Lippie’s Birthday Giveaway: What makes me happy. Next Post Glamour Magazine: get your Benefit freebies fast! That’s a grest rundown, thanks. Have you tried the Collection 2000 Illuminating concealer? It isn’t shimmery but it’s great when you put a bit over a regular concealer to lift the undereye area as it’s bright looking. And it’s only £5 or so. I might try the L’Oreal one as well. That’s a good tip on the prices Sarah, thanks.I had a quick look online when I was writing the review last night and found it for about £16.99 I think – not *too* bad! I have tried the Boots No7 Radiant Glow – that has actually been pretty much my go-to product since deciding the YSL was too much ££. But I don’t have one in my collection at the moment so didn’t write about it as couldn’t do the pics to compare. I will try and pick another up this weekend and do another comparison I think! I actually just started trying the Garnier one and it surprised me! as someone who is tanned it sure does work really well and makes me look awake. So you were spot on with that comment! Touche Eclat is way too pink for me doesn’t do a thing! In Douglas shops in Germany there is a Japanese brand called Annayake – their concealer/highlighter is excellent. I got a trial of the cream in the purple package and the touch éclat and I seriously need to get them. It costs too much for me to get both, but I have circles under the eyes that make me a perfect vampire without make up. Too bad that there is really no way I can escape the expense. I know its about budget products but I use by Terry Touch Expert. I know its even more expensive than Touch Eclat but IMO much much better and worth its price.